This morning, sightseeing starts at the Grand Parade, the city's main public square, to see the Castle of Good Hope and City Hall. Afterward, a WALKING TOUR introduces you to more of Cape Town's famous and historic landmarks. Stroll along Government Avenue to see St. George's Cathedral, Parliament, and much more. Next, you'll enter The Company's Garden, a beautiful oasis in the city, en route to Green Market Square, which at different times has been a fruit and vegetable market and even a slave market. Today, it is a great meeting place, where curios from all over Africa can be found. Visit the BO-KAAP MUSEUM before continuing your walk in BO-KAAP, also known as the Malay Quarter. Founded by former slaves in the 1750s, this lively area is a true melting pot of cultures. Colourful historic houses range from lime-green and pink to orange, reflecting Dutch and British architecture, and the area has been declared a national monument. 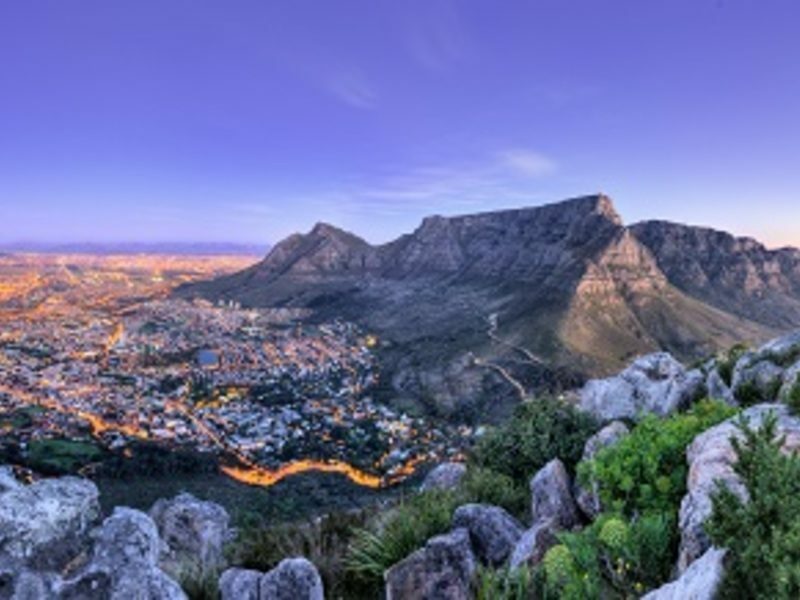 After a traditional Malay lunch, visit Table Mountain for a CABLE-CAR RIDE to the top (weather permitting) for stunning views of the city and its surroundings. This evening, join your travelling companions for a welcome dinner at a local restaurant. NOTE: Each year, generally in early August, the Table Mountain cableway closes for maintenance. During this time, we will visit Kirstenbosch National Botanical Garden. 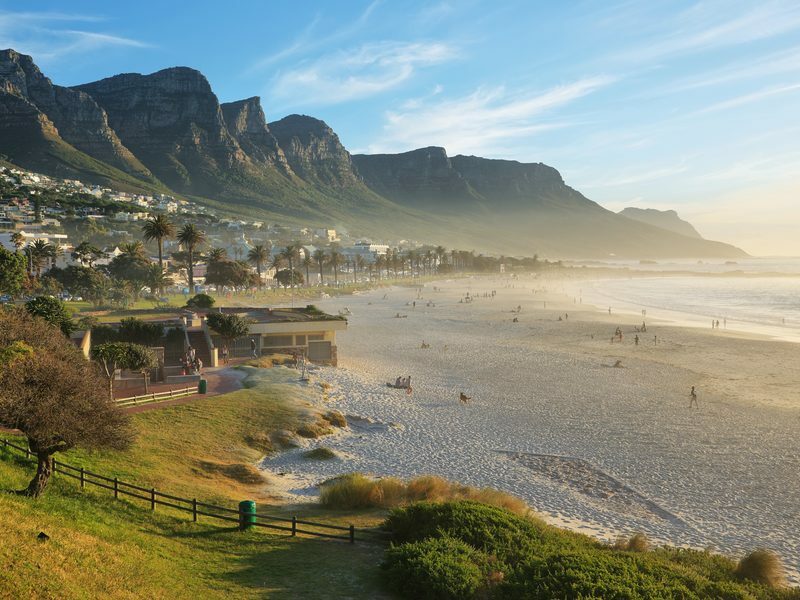 Today, enjoy a full day of sightseeing, starting with an orientation tour of Cape Town. Then, take a scenic drive south through the fishing village of Hout Bay before ascending Chapman's Peak Drive, which skirts the rocky coastline and is one of the most scenic drives in the world. Continue on to CAPE POINT NATURE RESERVE for stops at the Cape of Good Hope and Cape Point, the southwesternmost point on the African continent. Here, take a FUNICULAR RIDE to the steps of the old lighthouse for spectacular panoramic views. 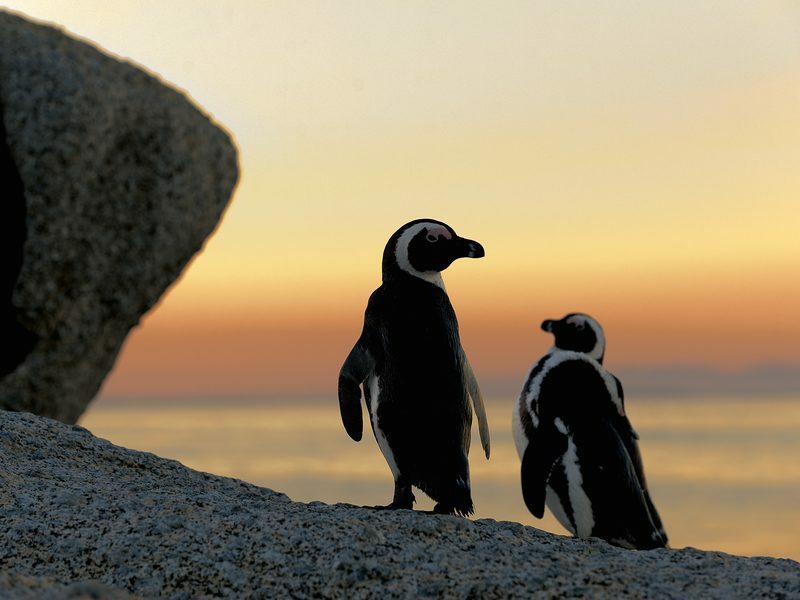 Afterward, visit Boulders Beach to see a COLONY OF ENDANGERED AFRICAN PENGUINS, known for the unique sound they make. Return to Cape Town and enjoy the evening at your leisure. Enjoy a full day at leisure for your own discoveries. 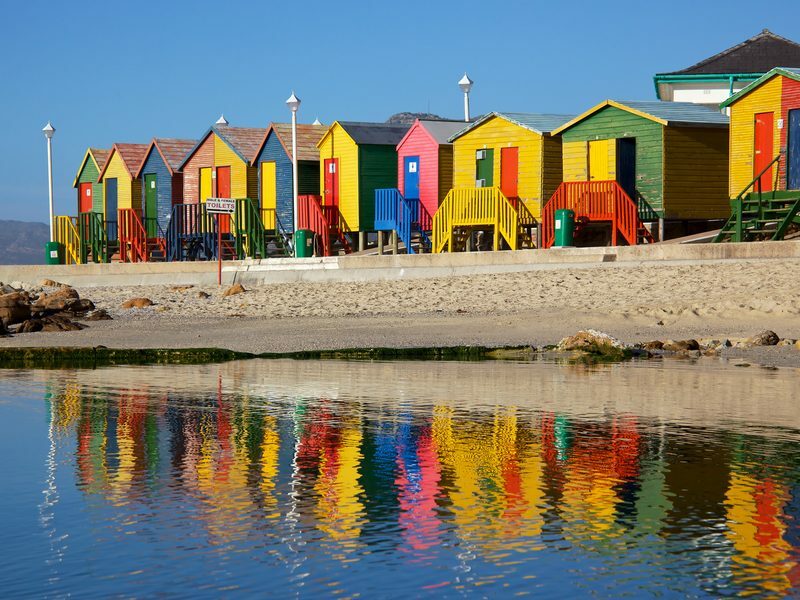 Perhaps explore the Victoria & Alfred Waterfront, take an excursion to the stunning Cape winelands for wine tasting, or cruise to Robben Island-where Nelson Mandela spent 18 of his 27 years in prison-for a guided tour. Your Tour Director has suggestions to help you make the most of your day. Today, leave beautiful Cape Town behind and fly to Hoedspruit and transfer to MAKALALI PRIVATE GAME RESERVE to begin your safari adventure! This area, near Kruger National Park, is famous for its abundance of wildlife, and you will have a great chance of seeing the "Big 5"-lion, leopard, elephant, rhino, and Cape buffalo. Enjoy your first GAME DRIVE this afternoon. Your skilled tracker and professional Ranger work together as a team, so you can learn more about the ecosystem as you view wildlife up close. Sip SUNDOWNER DRINKS prior to returning to your lodge for dinner. Rise between 5 am and 5:30 am for coffee and tea before your EARLY MORNING GAME DRIVE. If the timing is right, you might spot some of the big cats after a night of hunting. Other animals you may see include kudu, impala, giraffe, hippo, cheetah, spotted hyena, wildebeest, and more. Great bird watching is also possible-some 350 species having been recorded in the area. Return for breakfast mid-morning, followed by time to relax and enjoy the lodge and its surroundings. Perhaps take a swim in the pool, visit the wellness centre for one of its many spa treatments, or simply sit back and watch the animals. Consider an optional excursion to the nearby cheetah breeding facility. In the mid-afternoon, tea will be served prior to your AFTERNOON GAME DRIVE. Step out of your safari vehicle for SUNDOWNER DRINKS and watch as the sun sets over the Drakensberg Mountains. As darkness descends, your tracker will bring out a spotlight to help you spot nocturnal animals-if you are lucky, maybe even a leopard! Return to your lodge in time to freshen up before dinner. Today's sightseeing starts with an enriching visit to SOWETO (South Western Township), the largest township in the country. Soweto is a part of South Africa's turbulent past, but this multicultural area is also a reflection of today and hope for tomorrow. Along the way, see the neighbourhood that was home to two Nobel Peace Prize winners: Archbishop Desmond Tutu and Nelson Mandela. Gain some perspective of life here at MANDELA HOUSE, where Nelson Mandela lived from 1946 to around 1960, when he was forced underground to elude arrest. You will also see the Hector Pieterson Memorial, dedicated to the 12-year-old boy killed by police during a demonstration in 1976. This led to the Soweto Uprising, an important event in the long struggle to end apartheid some 14 years later. Next, visit the unforgettable APARTHEID MUSEUM to learn about the founding of South Africa before delving into the apartheid era. Using photos, video, and print, the museum takes you on an extraordinary journey through the apartheid years to the 1994 democratic elections that named Nelson Mandela president. 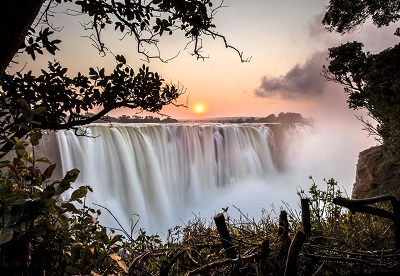 NOTE: During the dry season (Sept.-Dec.) and during particularly dry years, water flow to Victoria Falls may be low. Your tour ends with a flight back to Johannesburg. 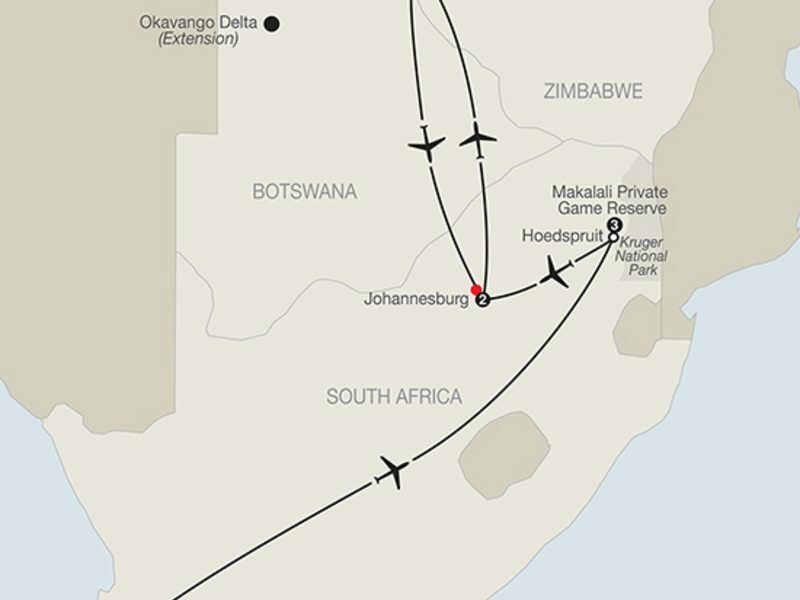 Spend one night in Johannesburg before your homebound flight the next day. Package is based on 19 May 2019 departure. Prices listed are per person in Australian Dollars, based on twin occupancy, including all discounts unless otherwise stated. The offer is subject to availability at time of booking. Fares are capacity controlled and are subject to change at any time without notice. Prices/Offers are correct as at 22 August 2018 and can be withdrawn without notice. Visas are not included. Airfares are based on economy class flights from Sydney and subject to the carriers’ flight schedules and conditions, please call us for prices from other cities. Payments made by credit card will incur a surcharge.